This customer who lives in Eaton near Congleton had a new barn conversion built with a 120 sq. 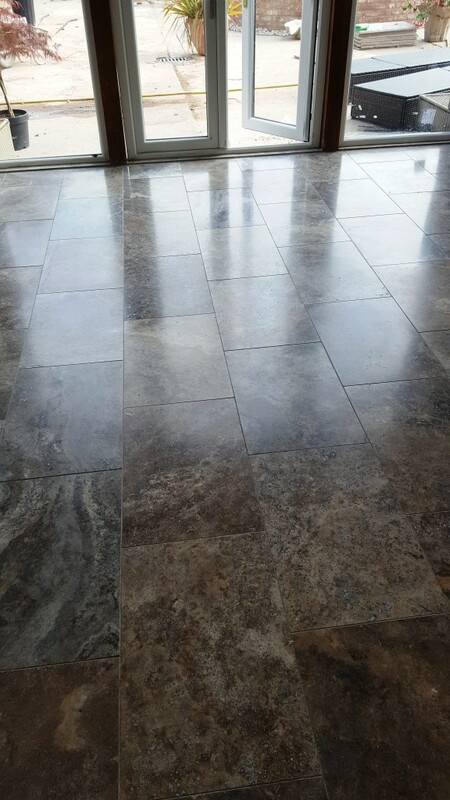 meters of polished Travertine floor tiles. 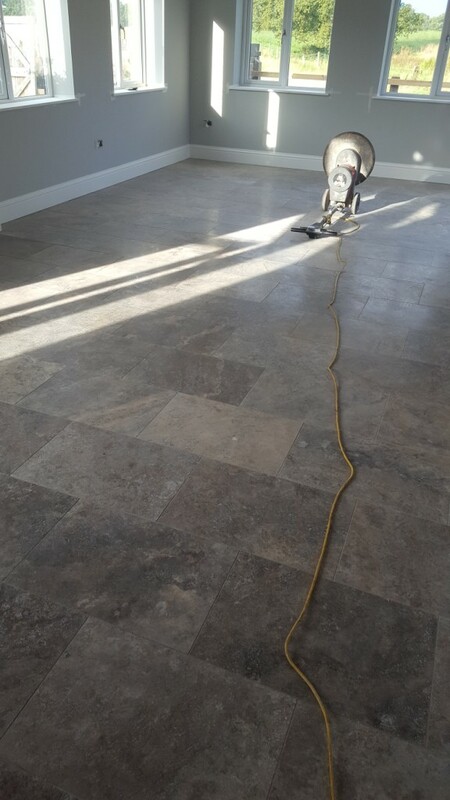 Unfortunately, he was unable to appreciate the beauty of the floor due to builder’s walking all over them for a few weeks without any protection. With dirt being trodden into the tile they were now in need of a deep clean and polish to bring back the shine and restore the real beauty of the tiles. After giving the floors a good brush to remove grit etc. 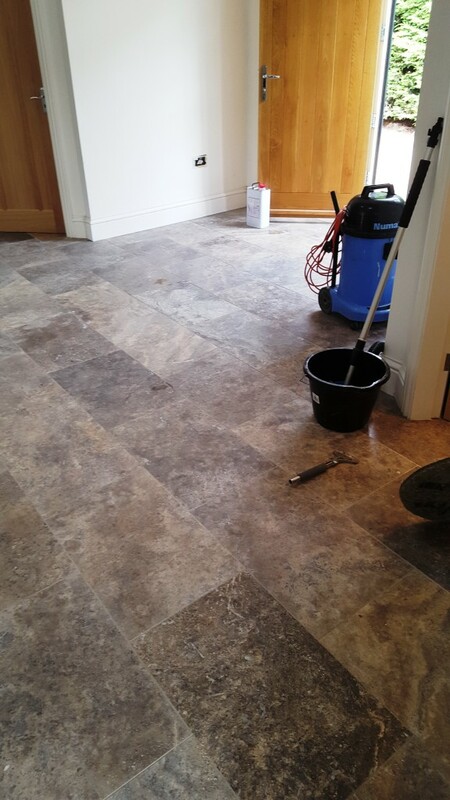 the next stage was to apply a set of tile doctor diamond encrusted burnishing pads to take off the ingrained dirt and restore shine to the tiles. The first pad was a coarse 400 grit which fits onto a rotary machine with water spread on the floor as lubrication. The pads literally scratch off the dirt and the resultant slurry is then removed with a wet vacuum. The floor is then washed and the process was repeated with the next two pads which are 800 and 1500 grit. These pads are much finer and restore the finish of the stone, again the floor is rinsed in between each pad to remove the slurry each time. The floor is then left to dry off overnight which is much quicker when underfloor heating has been installed. 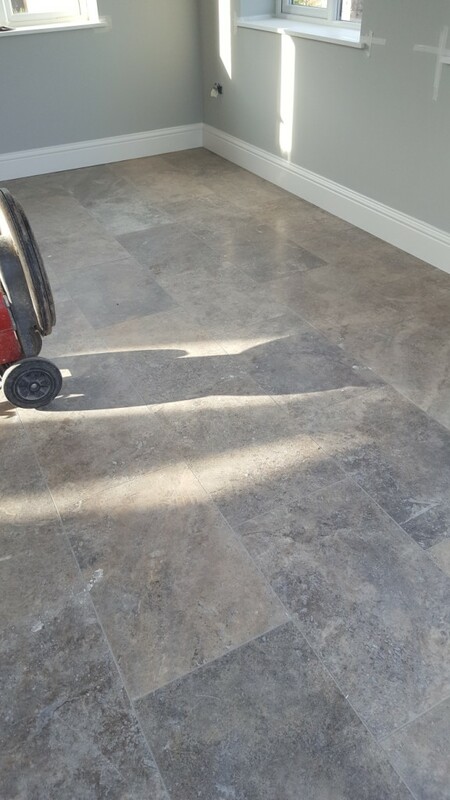 When I came back the next day I finished off the burnishing process using the last floor pad which is applied dry to the floor with a few squirts of water. 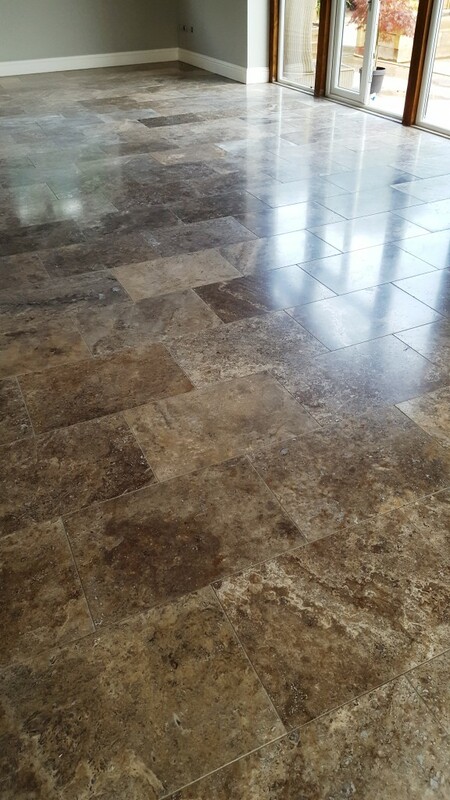 This final pad is 3000 grit which is super fine and builds up a high gloss shine on the Travertine. 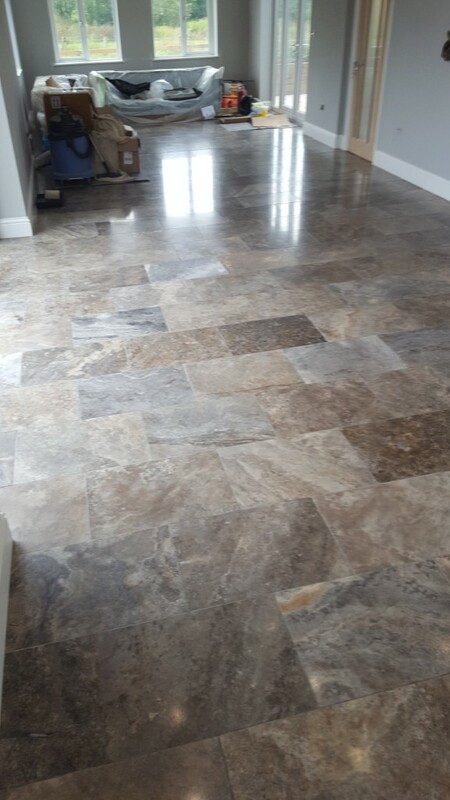 To finish off the process I then sealed the floor using a couple of coats of Tile Doctor Colour Grow which is an impregnating sealer that soaks into the Travertine occupying the pores and preventing dirt from becoming ingrained into the stone. 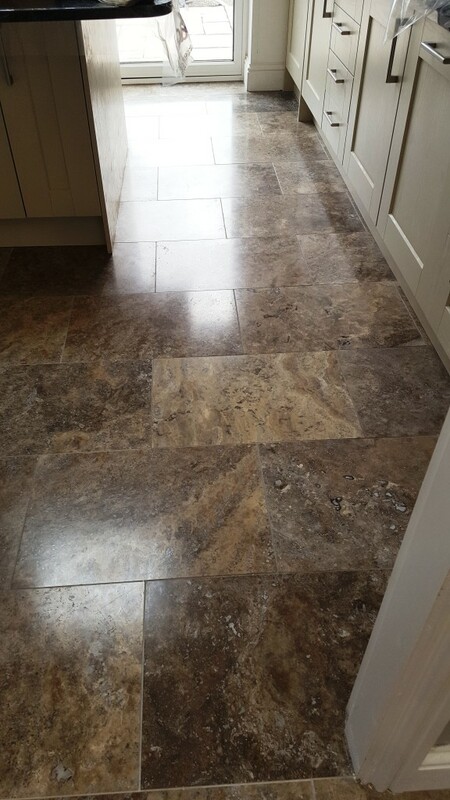 Colour Grow also enhances the natural colours in the stone and in this case, it did a great job of bringing out the brown shades in the Travertine. 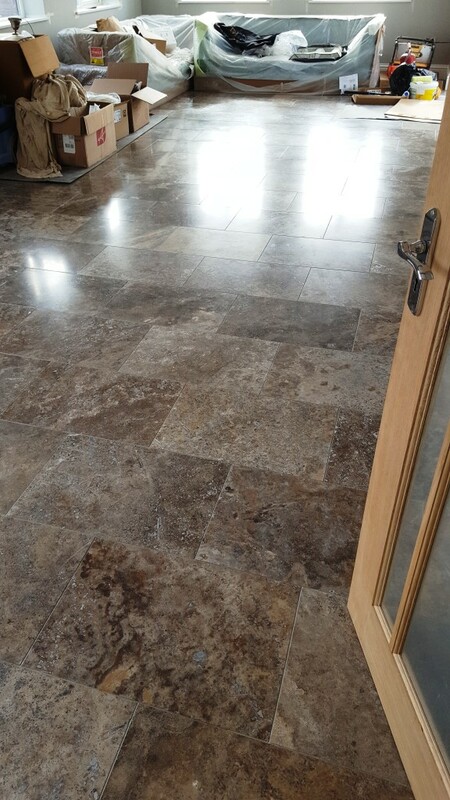 The customer was over the moon with the finish and asked if I would come back in three weeks to buff the whole floor to a high shine ready for a party that evening.